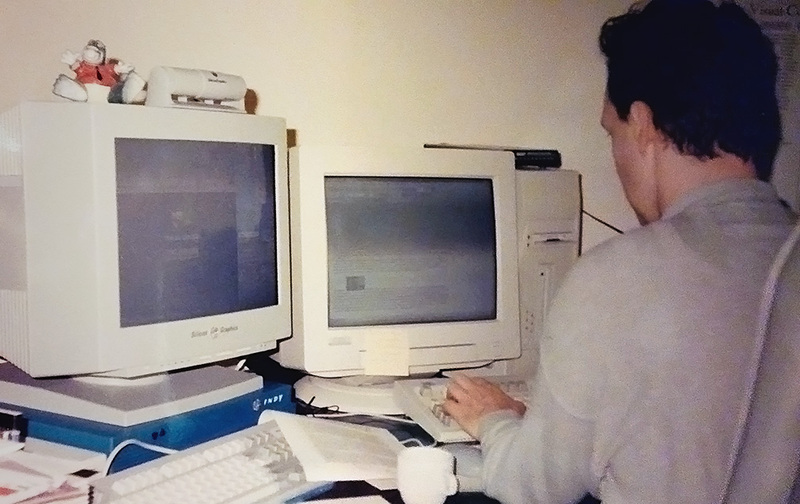 At work in my office in 1996, doing 3D animation (painstaking!!) on a 19,500 dollar¹ Silicon Graphics Indy workstation. Software was another 5,000 bucks. Rendering one SD (video-) frame (2 fields) took at least half an hour. A 30 second animation took a fortnight to render. So, you needed computing power, and thus another 2,500 for an extra “math processor board”. That brought render time down to slightly less than a week. In twenty years we’ll be laughing again, about what we do now and how much money we we’re willing to invest in technology that will be rendered obsolete in a few years from now. It hurts, but alas, that’s the way of progress.